Injuries are Wales' biggest fear in their final World Cup warm-up against Italy in Cardiff. Wales start their World Cup campaign against Uruguay on 20 September, before playing England, Fiji and Australia. 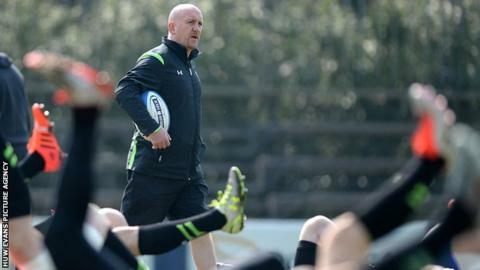 Defence coach Shaun Edwards says the warm-up games were a necessary evil as teams prepare for a "massive occasion". "We do want momentum, but we're keeping fingers crossed about injuries because it would be a travesty to get someone injured so late," he said. "But in the end you need match practise otherwise you're going to be undercooked going into what will be a massive occasion. "It's a necessary evil in a way that you have to have pre-season games. But it's more important at World Cup time when you have to peak in September and October... because you can't recover from a slow start." Wales had a scare in their last warm-up game against Ireland when lock Alun Wyn Jones suffered a knee injury. However, head coach Warren Gatland said Jones should be fit in time for the tournament along with long-term injury victims prop Samson Lee and back Liam Williams. Edwards added Wales were aiming to test their own and Italy's fitness by keeping the ball in play for a s long as possible in Cardiff. "We are looking for a good, fast and hopefully high ball-in-play-time rugby," he said. "That's something we're trying to concentrate on - keeping that ball in play. "Against Ireland it was up to 44 minutes which was one of our best efforts and we're aiming to get that up to 45, 46 or 47 minutes [and] that would be the best we've ever had." Centre Jamie Roberts, who is not playing against Italy, has said he is still "haunted" by Wales' 9-8 defeat by France in the semi-final of the 2011 World Cup. Wales played two thirds of the game with 14 players following the dismissal of captain Sam Warburton by referee Alain Rolland for a tip-tackle on wing Vincent Clerc. Edwards agreed that experience was still raw. "I've said a number of times there's still a little bitterness from the last World Cup," he said. "Mr Roland gave a decision against us... he thought it was the right thing to do. "It's something [an offence] I've noticed recently it's regularly given as a yellow card, they go to the video referee. "But it's not a criticism of Alain Rolland. He's one of the world's best referees, we've won many a game when he's been in charge, it's just we had a big decision go against us. "You don't get many chances to get in World Cup finals and it is still a bitter feeling, a bitter taste."